Sen. Dianne Feinstein, D-Calif., talks to Sen. Patrick Leahy, D-Vt., on Capitol Hill in Washington during the Senate Judiciary Committee's business meeting to discuss the nomination of Attorney General-designate Sen. Jeff Sessions, R-Ala., Jan. 31, 2017. Senate Democrats retaliated for Sally Yates' removal at the Department of Justice by derailing Sessions' expected confirmation, citing concerns that his closeness to President Donald Trump would impede his ability to make independent decisions in the role. Congressional Democrats pushed back Tuesday against President Donald Trump, declaring his controversial executive order on immigration "unconstitutional," just hours after he fired Acting Attorney General Sally Yates for refusing to enforce the ban. Democrats, already outraged by the order temporarily limiting immigration from seven Muslim-majority countries, hailed Yates as "a patriot." The former acting attorney general had told Department of Justice employees in written guidance that she did not think a defense of the order was legal. The surprise firing increased Democratic ire on both sides of the Hill, sparking partisan battles as many Republicans continued to defend the goals and the legality of the order. The White House defended the president's decision to fire Yates, saying she was "not only responsible but required to execute lawful orders." Press secretary Sean Spicer described Yates' decision not to execute the order after it had gone through the Department of Justice's Office of Legal Compliance as "bewildering and defiant." But Democrats pointed to Yates' firing as further proof the executive order would not stand up in court because of numerous alleged violations of the Constitution. "The executive order discriminates by design. It's wrong. I believe it is illegal," Democratic Senator Patrick Leahy of Vermont told the Senate Judiciary Committee. "Several federal courts have already found that President Trump's order is very likely unconstitutional." Senate Democrats retaliated for Yates' removal by derailing the expected confirmation of Trump's attorney general nominee, Republican Senator Jeff Sessions of Alabama, citing concerns that his closeness to Trump would impede his ability to make independent decisions in the role. "The attorney general is the people's attorney, not the president's attorney," Leahy said. "Ms. Yates' willingness to defend the rule of law, instead of defending President Trump's political whims, demonstrates exactly why having an independent attorney general is so important and why we have to be so careful in selecting our next attorney general." FILE - Rep. Zoe Lofgren, D-Calif., speaks during a news conference opposed to immigration raids targeting Central American families with children, on Capitol Hill in Washington, Jan. 12, 2016. On Jan. 31, Lofgren said President Donald Trump executive order on immigration "violates the law, it violates the Constitution and it violates good sense." Democrats lined up on the House floor Tuesday in an ultimately failed attempt to bring legislation rescinding the president's executive order up for a vote. 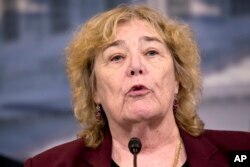 Representative Zoe Lofgren, a California Democrat who joined several others in introducing the legislation, said, "The president's executive order of Friday violates the law, it violates the Constitution and it violates good sense." Lofgren argued that the order violates the law based on language in the Immigration and Nationality Act, which specifically prohibits nationality-based discrimination in the issuance of immigrant visas and other visas. House Minority Whip Steny Hoyer of Maryland took to the floor earlier in the day to argue that while the president has a duty to protect the nation, Congress is required to play a role in protecting the Constitution. "This Congress has a sacred duty to hold the president accountable and ourselves, doing so in a way that respects our Constitution and our values," Hoyer said. The efforts on the House floor followed a Monday night rally of House and Senate Democrats on the steps of the U.S. Supreme Court, surrounded by hundreds of opponents of the ban who chanted to the lawmakers, "Do your job!" House Minority Leader Nancy Pelosi of Calif., left, and Senate Minority Leader Chuck Schumer of New York stand as Rep. Jerrold Nadler, D- N.Y., speaks in front of the Supreme Court in Washington about President Donald Trump's recent executive orders, Jan. 30, 2017. Standing at right is Sen. Ben Cardin, D-Md. "What the president did is not constitutional. 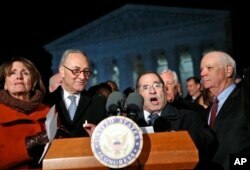 Indeed, the view of many of us is it is immoral," House Minority Leader Nancy Pelosi of California told the crowd. But Representative Raul Labrador, an Idaho Republican who has practiced immigration law, said, "The law specifically states that the president of the United States for national interest reasons can stop the entry of any immigrant or non-immigrants — the law's actually really clear on that." Labrador told reporters he thought Yates' decision lacked a legal basis. "On her own, she decided this was illegal, and there is no case law out there that says it's illegal," he said. House Speaker Paul Ryan of Wisconsin did not comment on the firing of Yates but told reporters Tuesday that the order was "something we support." Ryan — who had strongly criticized candidate Trump's proposal for a ban back in 2015, citing the cooperation of Muslims as a key element in combating terrorism — said he did not want to debate the order. The legality of the executive order will ultimately be tested in a longer-term battle fought in the courts. "It's a threat to our Constitution," Massachusetts Attorney General Maura Healey told reporters Tuesday, announcing her state would be among the first to join a federal lawsuit challenging the constitutionality of Trump's executive order. According to Healey's office, the order violates the equal protection guarantee of the Fifth Amendment by discriminating against people on the basis of their country of origin or religion without sufficient justification. The lawsuit also alleges violations of the Establishment Clause and the due process guarantee in the Fifth Amendment, among others, as reasons for the unconstitutionality of the order. Healey was one of 17 Democratic state attorneys general to sign a letter pledging to work "to ensure the federal government obeys the Constitution, respects our history as a nation of immigrants, and does not unlawfully target anyone because of their national origin or faith."